Despite the rather off putting name, the Infernal Blues Machine made a few really good soul ballads in the 70s – ones that don’t seem to have got the recognition they deserve. 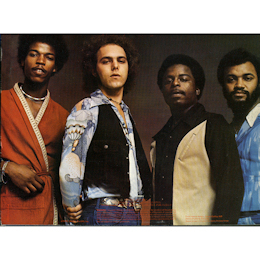 IBM was a four piece band comprising Mike Cavanaugh on keyboards, Greg Middleton on bass (who write most of their best songs), Greg Parker on guitar, and Warren Ray (or Raye) on vocals. And no matter how good a set of musicians the others were, the key player was Ray, who had a great voice, full of lovely touches and tones. Their tracks were produced on the West Coast by Middleton and the talented William “Mickey” Stevenson. The group made an LP as a soundtrack to a very poor western called “Adios Amigo” on which funk tracks like “Ju Ju” made an appearance. The movie’s title track was released on a 45 as well, but the flip Ain’t That Love knocked it into a cocked hat. Ray’s rich vocal – with its nod towards the sublime Donny Hathaway’s style – made the song a real winner. Love the tenor sax break too. 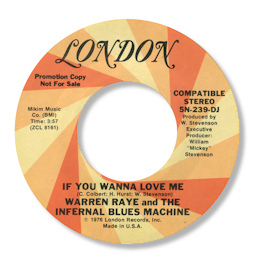 Ray got a deserved name check on the second single “If You Wanna Love Me” which was another excellent uptown ballad. Neither side was on the album but it did include two further high class tracks. The lengthy “Write Me A Letter” which Stevenson set in a Philly style arrangement (think Harold Melvin for example) on which Ray was outstanding. But for me their best track was the highly melodic When Love Calls Your Name. The way it builds and builds is superbly well done – and Ray puts in a couple of falsetto bursts which ratchet up the emotional temperature.